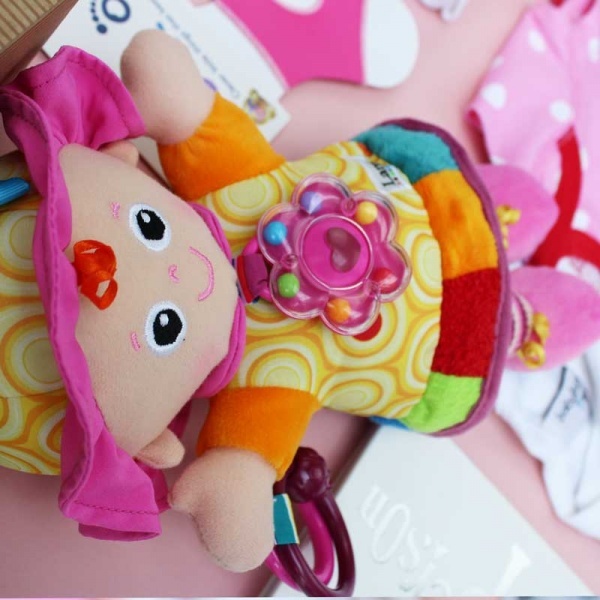 The gorgeous smiley face of the Lamaze My Friend Emily is the first thing you see in our luxury baby girl's hamper, and what a great start that is! 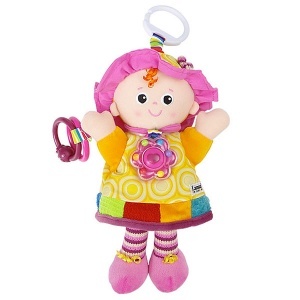 Lamaze My Friend Emily - a soft and cuddly doll toy that is covered with textures, patterns and bright colours to stimulate baby's senses. A great size for play at home or on the move, she comes with a handy pram clip so she doesn't get lost. 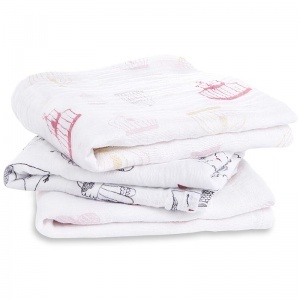 Aden & Anais muslin squares - this box contains two of one of our favourite products. These are squares of muslin cotton that are the best multi-purpose gift. 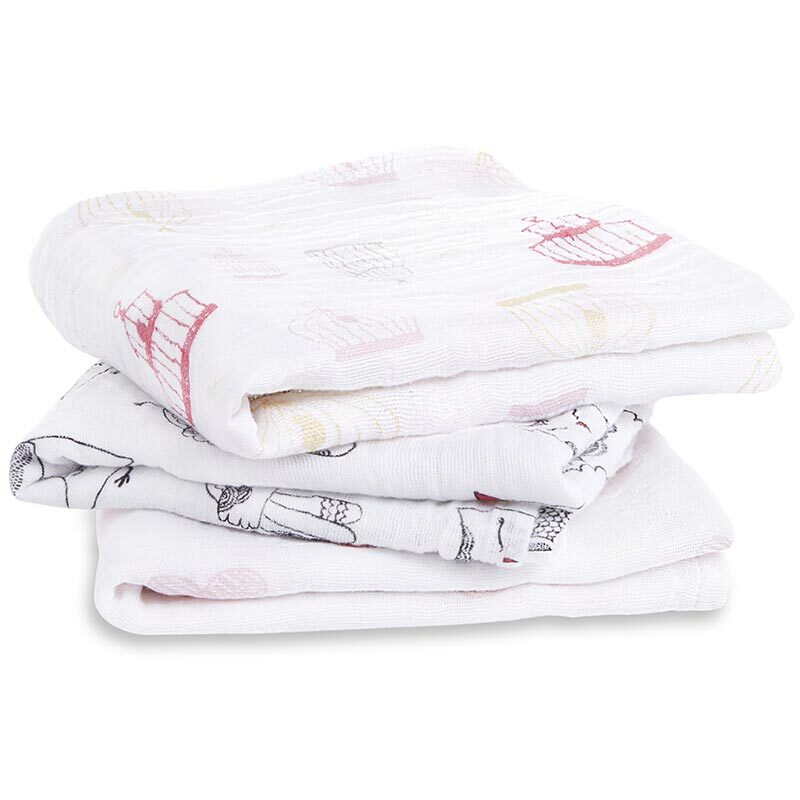 You can use them as a comforter, burp cloth, breast feeding cover-up to name just a few. From designer brand Aden and Anais, these one's have a beautiful girly bird print decoration. Sleepsuit in white - one of our own brand 100% cotton all-in-one that can be worn at night, or quality enough to wear during the day. Pure white with a funky rabbit print to the front. Age 0-3 months. Bodysuit in pink - a printed pink vest top is ideal for summer wear or as a base layer during the colder months. Exclusive to our shop, this is printed with a 'Hello World' design and comes in 0-3 months size. Cotton Hat - A white cotton knotted hat, matches perfectly to the sleepsuit and bodysuit above to make a pretty outfit. 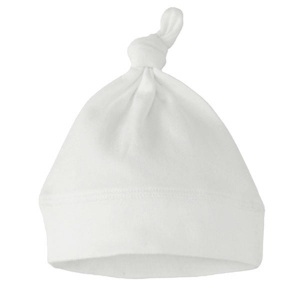 Age 0-6 months - a newborn essential. Sock On's - a fantastic product we have been selling from the start. Keeps babies socks on and included here in a cerise pink colour. Age 0-6 months. 'And Relax' scented lip balm - a beautifully Lavender scented natural lip balm. 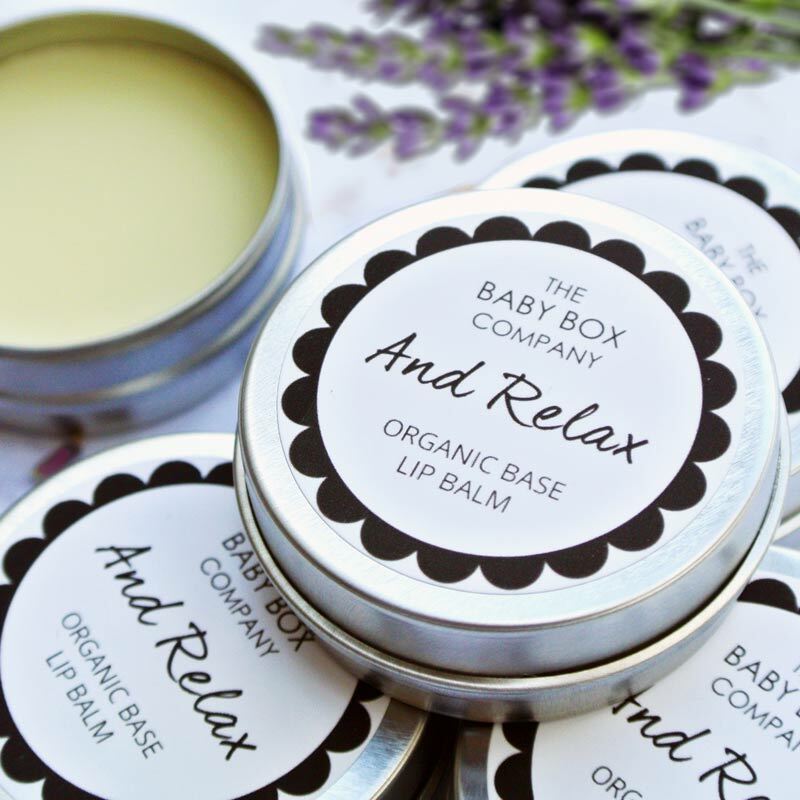 A real treat for your new mum. 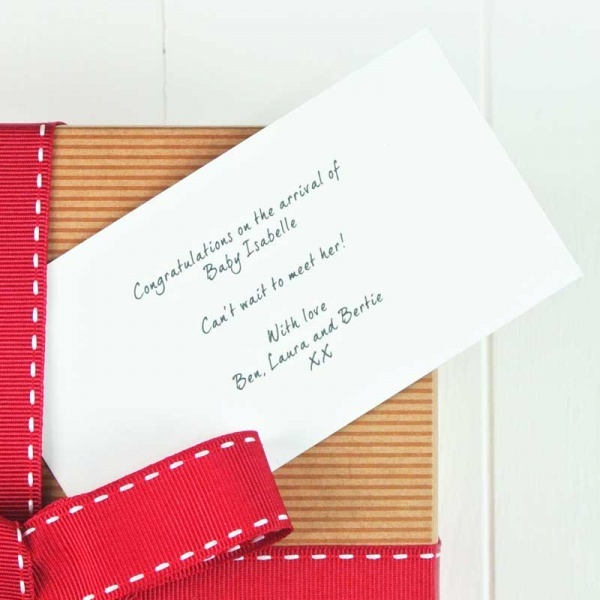 All of our hampers are carefully hand packaged in our unique Baby Box luxury wrapping FREE OF CHARGE and come with a personalised gift card. 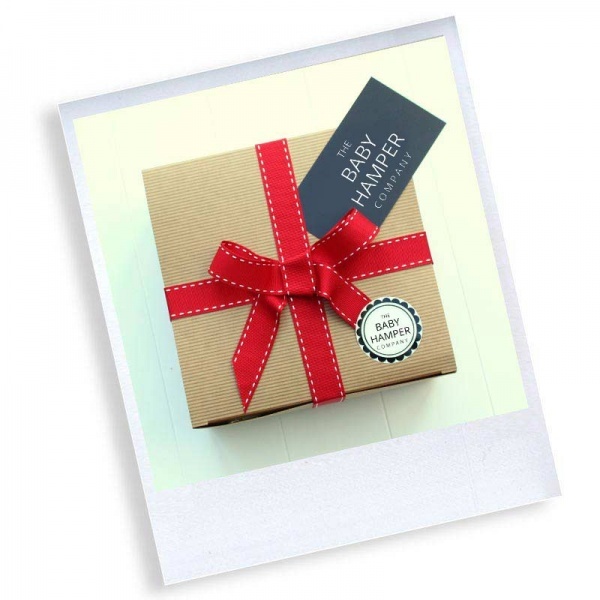 Spend over £100 with The Baby Hamper Company for FREE UK STANDARD DELIVERY.